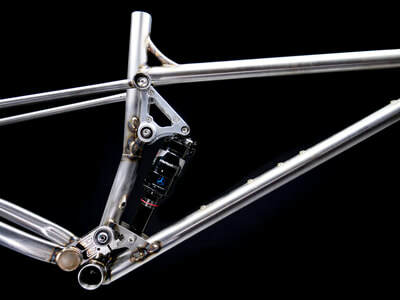 One of the first comments about this frame is 'oh my goodness those stays are skinny!' From the side profile, yes the middle section of the stays is skinny, from the rear they're a fair bit wider and there is good reason for this. They've been flattened slightly to allow them to flex in the vertical direction. When designing with steel, weight and cost is always a consideration. 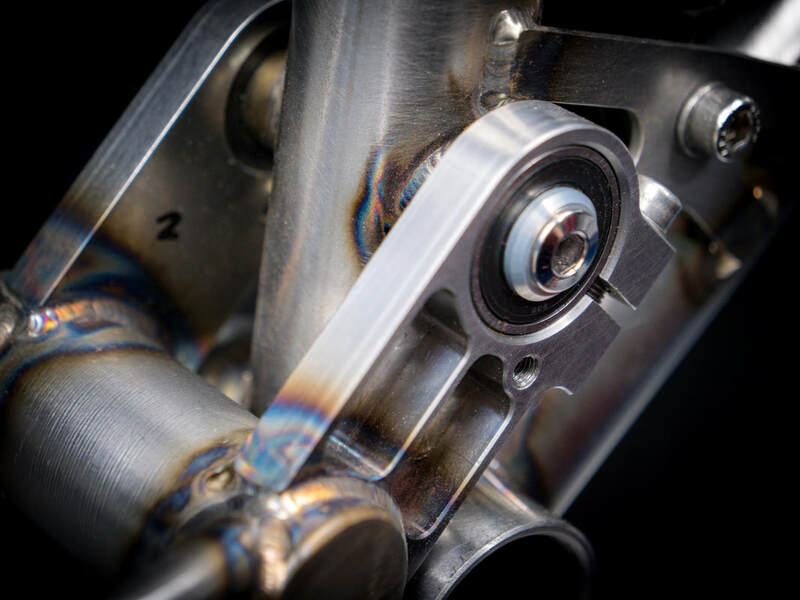 More pivots means more machined parts that are expensive to manufacture and add weight. The design of the Contour makes use of one of steel's best traits, you can flex it (within limits) and it doesn't fatigue. 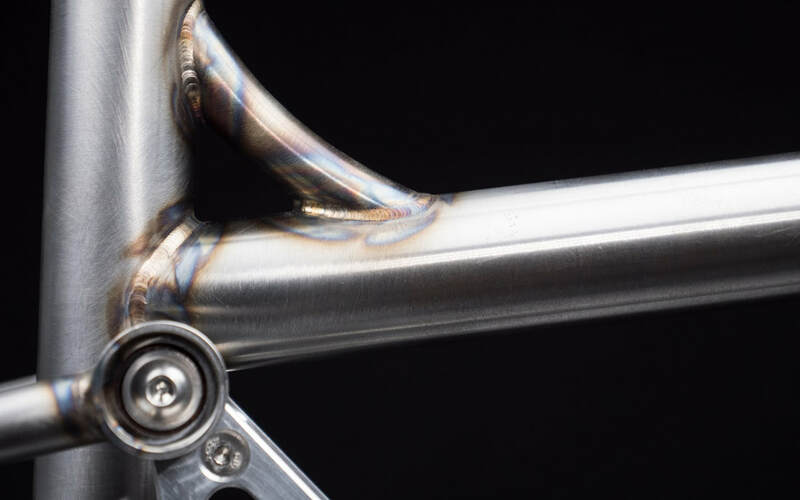 On the Contour the seatstays actually flex vertically slightly as the suspension moves, this removes the need for a pivot at the dropout, saving weight and cost. There is also one less set of bearings to worry about and overall it's probably a slightly stiffer structure. The design has been optimised to give the least amount of flex, the stays only flex 3mm in either direction. The kinked seat tube maximises the available length of seat tube for the dropper post. A bent tube reduces the max insertion depth by around 50mm (due to the bend radius) which for some customers could be a deal breaker. Exposed bearings on a bike designed for UK riding may not seem like the best idea! 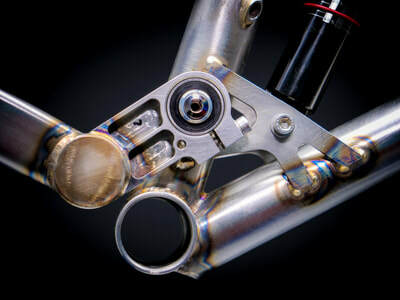 Most frames have neat machined covers over the bearings, out of sight out of mind. Creating a secondary seal as part of the cover on both sides of the bearing is next to impossible (I'm sure there are some manufacturers who do manage this). So my theory is that the neat (unsealed) cover may actually hold water and crud up against the bearing seals for longer. On the proto frames the bearings were left as open as possible to fend for themselves. I recently changed the first set of bearings on my personal bike. It had done 2250 Km over the course of a year (including a Scottish winter) and the bearings had outlasted two BB's and a headset. ​Obviously there is way more to bearing life than sealing alone, the Contour frame uses bearings with relatively large ball diameters on all pivots, (8mm x 8mm bearing cross section) finally a nice straight frame puts even loads through the pivots. All of these things contribute to good bearing life. Form follows function again. Pan headed bolts on the linkage pivots look neat and refined, however they're a pain in use. 4mm hex with hardly any insertion depth rounds out easily. We used them for a bit on the prototype bikes and ended up just giving up on the sleeker look and switching to cap headed bolts. 5mm hex with a proper insertion depth makes rounding almost impossible. There's nothing more annoying than a rounded bolt on a linkage pivot, that's come loose, halfway around an amazing ride! All the pivot hardwear on the Contour is stainless all requires the same sized (5mm) allen keys to tighten. The contour has a progressive leverage rate curve using a 200 x 51mm shock to give the 115mm of rear travel. The design works well with both air or coil shocks.